BRUSSELS, Belgium -- NATO chief says Russia must end the violence as both sides move heavy artillery close to front line. 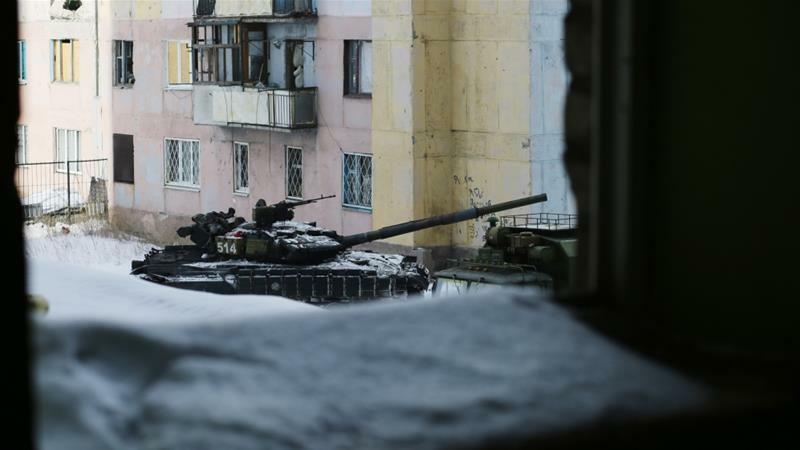 The death toll from the latest escalation in fighting in Ukraine rose to 19 on February 1 as international alarm rang out. NATO Secretary General Jens Stoltenberg has called on Russia to use its "considerable influence" to end fighting in eastern Ukraine after a renewed surge in violence there. Moscow-backed rebels and government forces have traded blame for the flare-up in the industrial east that has seen the highest casualty rate since mid-December and cut off power and water to thousands of civilians on both sides of the front line. The shelling eased on Wednesday, but clashes near the Kiev-held frontline town of Avdiyivka brought the festering conflict back into focus amid warnings of a looming humanitarian crisis. "We call for an immediate return to the ceasefire," Stoltenberg said in Brussels. "We call on Russia to use its considerable influence over the separatists to bring the violence to an end." Ukraine and NATO accuse Russia of providing troops and weapons to support separatist rebels in the country's east in a conflict that has killed 10,000 people since April 2014. Michael Bociurkiw, a former spokesman for the European security body OSCE's mission to Ukraine, told Al Jazeera that the new US administration was not being clear about how it would deal with the rising tensions. "In the previous administration, Russians were really attacked for their activities in eastern Ukraine but the Trump administration is really sending mixed signals," he said. "The big fear is that Trump may withdraw support for the sanctions against Russia and that could turn a chain reaction where Greece, Italy and other EU members may also withdraw support." The NATO factor Ukrainian President Petro Poroshenko is planning a referendum on whether Ukraine should join the NATO alliance given polls that show 54 percent of Ukrainians now favour such a move, Germany's Funke Mediengruppe newspaper chain reported on Thursday. "Four years ago, only 16 percent (of the Ukrainian people) favoured Ukraine's entry into NATO. Now it's 54 percent," the media group quoted Poroshenko as saying in an interview. "As president, I am guided by the views of my people, and I will hold a referendum on the issue of NATO membership." He vowed to "do all I can to achieve membership in the transatlantic alliance" if the people voted in favour. NATO and Ukraine have had a close relationship since the early 1990s, and their ties are one of the "most substantial" of NATO's partnerships, according to the alliance's website. However, any move by NATO to admit Ukraine would spark tensions with Russia, which says NATO already violated earlier promises by admitting Poland and other eastern European countries in the 1990s. Poroshenko also predicted it would not take long until Ukraine fulfilled the entry criteria to join the European Union. He said Kiev had reduced its budget deficit and inflation, and had taken important steps to reduce corruption. The EU last year spelled out limits to a landmark cooperation agreement with Ukraine to address Dutch concerns, but said the deal did not make Ukraine a candidate for EU membership.